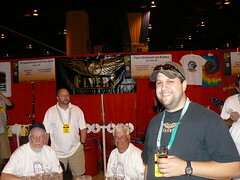 Tony Savoy at GABF in 2008. On September 29, the 30th annual Great American Beer Festival will kick off in Denver, CO. Around 49,000 attendees are expected (it sold out in a week) and 465 breweries will be on hand to pour more than 2,400 beers. If you haven’t been, the festival is a must at some point in your life for anyone who calls themselves a beer drinker. There are two parts to the festival: the country’s most-respected private judging and awards recognition for beer, and then the festival for the public. Of the 465 breweries on hand, 28 of them will be representing Washington. As a preview for those going and as a guide to who might be up for awards this year, I’ll be posting as much GABF beer info as I can get from WA breweries over the next couple weeks.